Kayachikitsa or internal medicine is a subject which ahs attached attention of all those who are eager to learn Ayurveda. Physicians of other medicines, students and common people all want to know more about this subject as it deals with description of various diseases and its treatment. This book of Kayachikitsa in 3 volumes has been written more in the interest or ht students of Final Year of Ayurveda. 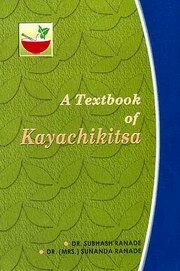 The syllabus of Kayachikitsa for final B. A. M. & S. examination has been divided in 4 papers and the first three papers have been covered in detail in three volumes respectively. The fourth paper deals with Panchakarma and we have published a separate book for this paper. The first volume of this book deals with Paper-1 which comprise of Introduction to Kayachikitsa, Vyadhi dosha, Vyadhi-samprapti, Ama: Metabolic toxin, alternative medical systems like yoga, naturopathy, Siddha system, Unani medicine, Tibetan medicine, homeopathy, osteopathy, chiropractic. The second volumeof this book deals with Paper-2 which comprise of Jwar, Annavahasrotas, Mutravahasrotas, Pranavaha srotas, Rasavaha srotas, Asthivaha srotas, Purishavaha srotas, Yauna Samkramita roga, Chayapachaya-janya vyadhi, Tvag-roga. The third volumeof this book deals with Paper-3 and Paper-4 which conprise of Vatavyadhi, Kuposhanaja, vyadhi, Antahsravi granthi vyadhi, Herditary & other diseases, Kshudra roga, Manasa roga, Vardhiki, Rasayana, Vitamins, Vajikarana, Rasayana & vajikarana yoga. The volumes have also been supplemented with Appendics, Glossary etc. to enhance the utility of the work. This work will be of use to the students of Final B. A. M. S. as well as physician and common people who are interested in subject. Dr. Sunada Ranade is an expert Ayurvedic gynecologist and nutritionist. She is Director of International Academy of Ayurveda, Pune, India and is working in the field of Ayurveda and Yoga since last 35 years. Dr. Sunanda Ranade has written hundreds of articles on Ayurveda, which have been published in magazines and newspapers not only in India but also in Italy and Germany. She is also the author of several books on Ayurveda, which have been publsihed in Marathi, English, Italian and Spanish languages. She is working as visiting Professor to various Institutes in United States Like Ayu-Seattle, American Institute of Ayurveda-San Francisco, Seva Academy-Munich, Germany, SKA Ayurveda-Milan, Italy and Bergler Massage School in Graz, Austrai, She has conducted many courses on Gynecology, Ayurvedic nutrition and Ayurvedic massage for physicians and common people in these countries. Dr. Subhash Ranade was formerly Principal of Ashtang Ayurveda College, Pune, India and is the autor of more than 92 books on Ayurveda, which have been published in German, Polish, Italian, English, and many Indian languages. he has the honour of being visiting Professor to all the colleges of Ayurveda in USA and other institutes like Sewa Akademie in Germany, Ateneo Veda Vyasa in Italy, Foundation of Health in Poland and Ayurveda International Difussing Association of Japan. Since 1981, he has visited and has conducted hundreds of Ayurveda courses for medical practitioners in Europe, U.S. A. and Japan. very informatie & valuabe book on ayuredic literature ..